People from all over the world take in this event because they’ll have the choice of 20 guided tours in four days. They’ll have the opportunity to see all 11 species of woodpeckers in the Sisters and Central Oregon region, and also potentially to observe 200 additional birds of the area. That’s what makes the festival so wonderful for both experienced and novice birders. A few years back a couple arrived in Sisters from France who were more than serious birders; they wanted to see the woodpecker of Sisters, the white-headed. The thousands of dollars they spent getting here all came into focus when right near Conrad Weiler’s layout in Camp Sherman a male white-headed woodpecker flew right across the road. “That’s it! That’s it!” Came the excited cry in a French accent. Then all that could be heard were whispered, “Ohs” and “Ahhs” (in both French and English) as the bird was made real in their binoculars. The festival commemorates Dean Hale, an ECAS member who was tragically killed in an auto accident in 2012. ECAS Board Member Sherrie Pierce, who birded with Dean Hale for years, said, “Dean loved birds but more than anything he was a people person. His influence is still seen today on many of the conservation and citizen science projects East Cascades Audubon volunteers support. Two ECAS volunteers guide each trip. Festival tours are limited to 10 participants and typically fill quickly. Tours include an all-day trip to Summer Lake on Thursday. On Friday there will be a birding tour to the Crooked River Country and a different trip to the Shevlin Park/Awbrey Hall Burn. Birding trips are all day on Saturday and mornings on Sunday. The tours go to places such as Three Creek, Pole Creek, Cold Springs, the Milli Burn, Abbot Creek, Camp Sherman, Glaze Meadow, Indian Ford, Suttle Lake and Green Ridge, as well as several other excellent birding areas. Both weekend days also provide limited mobility birding tours for folks who would like a leisurely pace, use a wheelchair or prefer to walk short distances. In addition to the birding tours, the festival offers a native plants/birding tour on Saturday and, on Sunday, an opportunity to experience the banding of kestrels and bluebirds. The Saturday-night schedule features an owl prowl and a social gathering at The Belfry in Sisters. Tours take place under a special-use permit with the Deschutes National Forest. Participants provide their own transportation, and carpooling is required. 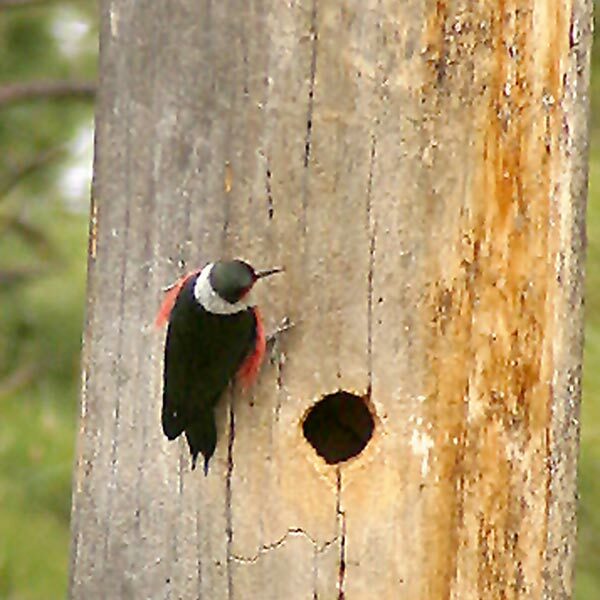 For information about the Dean Hale Woodpecker Festival visit http://www.ecaudubon.org/dean-hale-woodpecker-festival or email dhwf19@gmail.com.